Dr. James Goldenberg is a Board-Certified Neurologist practicing in Palm Beach County Florida for 23 years. Though the majority of his time is spent in general neurology clinical practice, Dr. Goldenberg is active in teaching, research, and advocacy in multiple venues. His undergraduate training is in Psychology from the University of Florida. He received his Medical Degree from the University of South Florida. His neurology training and fellowship in neuromuscular disease were completed at the University of Miami. Dr. Goldenberg practices neurology with First Choice Neurology. He previously practiced with Medical Specialists of the Palm Beaches, an 80-physician multi-specialty group with 6 neurologists. He has served in multiple leadership roles within the organization, culminating in his election as President and Chairman of the Board in 2013-14. 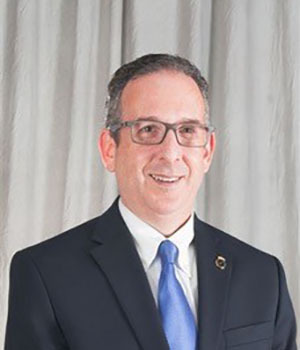 Dr. Goldenberg has served JFK Hospital in multiple leadership roles including Chairman of the Board of Trustees, Chairman of the Credentials Committee, Chairman of the Bylaws Committee, and Chief of the Department of Psychiatry and Neurology. He was the founding Medical Director of JFK Hospital’s stroke program and has helped develop their Comprehensive Stroke Center. Dr. Goldenberg has served The Joint Commission as a disease-specific surveyor in stroke, the first physician to hold that position nationally. Dr. Goldenberg is a founding member of JEM Research Institute, a clinical research organization that performs predominantly industry sponsored phase II – IV clinical trials to help develop new treatments in the area of neurology. JEM is also affiliated with the University of Miami Regional Coordinating Center of the NIH Strokenet. Dr. Goldenberg is an Affiliated Assistant Professor of Neurology at the Leonard M. Miller School of Medicine at the University of Miami. Dr. Goldenberg is an advocate for patients and physicians at the local, regional, and national levels. He is a Past President of the Palm Beach County Medical Society. He is serving the Florida Medical Association on the Board of Governors and as Vice Chair of the Council on Medical Economics and Practice Innovation. He is serving the American Academy of Neurology, a 32,000-member organization, on the Board of Directors, Vice Chair of the Government Relations Committee, and the Leadership Development Committee. Through advocacy, education and the promotion of physician leadership training, he would like to help physicians prepare for the changing healthcare landscape.